Last week I decided to listen to the last presidential debate while catching up on some housework. Big mistake!!!! By the end of it, not only was my body feeling tense, but my whole disposition, had somehow absorbed it all and become combative. Before I knew it, I was snapping at my whole family over nothing! How are you feeling about the upcoming election? Have you noticed all the hate, fear, and cynicism in the air? We are living in really intense times where emotions seem to be running high most of the time! So what can we do to take care of ourselves and keep thriving? Albert Einstein taught the principle that everything is created energetically first. "Energy before matter," to be more specific. Given the current state of our country and the enormous problems we're facing perhaps the most empowering thing we can do is keep working to clear the stress and negativity. To notice how we're feeling and choose to release the tension. In my mind, doing this is a powerful act of defiance, a refusal to be sucked into the lies and spin that's going on around us. It grants us the true capacity to take a step back and really observe what's going on with a clear mind and grounded position. No more need to argue and lash out, or to join the madness that seems to be growing exponentially each day. The more calm, grounded, and connected to our own inner wisdom we can become, the stronger we will be. We will no longer be controlled and manipulated because we can feel our way through the lies and somehow see through the deeper agendas behind what's going on. Once we know this, we come to realize there's no point in jumping into arguments and attacks. The goal is wisdom, clarity, and guidance not "being right" and "winning." Each one of us that is willing to work toward this state of being can affect others and calm things down. This is how we use Einstein's teaching to manage the energy first, rather than trying to argue through all the "troubling matter" going on around us. It allows us to live our lives on a higher level that gets more satisfying results. Today I wanted to share a simple Meridian Tapping exercise designed to help clear the stress that's going on all around us. This clearing will be specifically geared around the United States election and all the upset that is surrounding it. 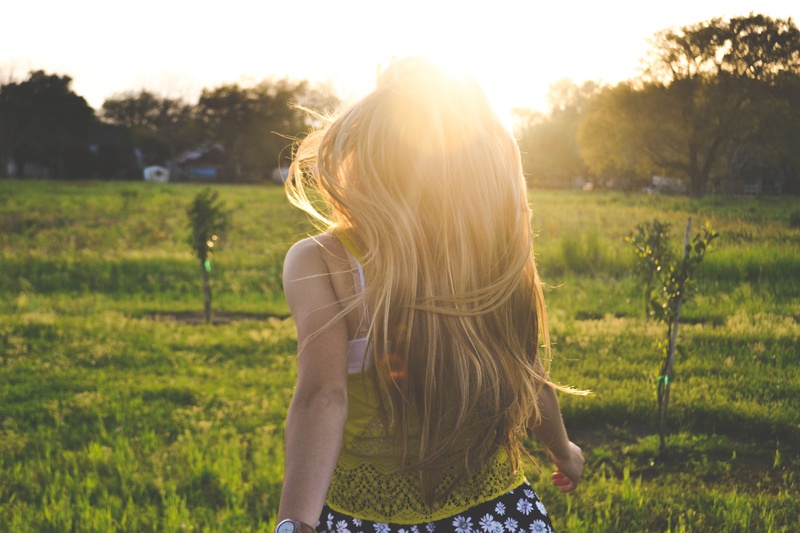 If you're not living in the states, you can use this clearing as a way of detaching from any drama or negativity that is influencing your world. The goal of the clearing is to unplug, to detach, and to connect with your own sense of wisdom and purpose. Coming from this place we are all more empowered, more open to solutions and how we can contribute and help others. Mostly, by calming ourselves, we don't feed the problems by adding our energy to them. We take the "fuel" away from the fire rather than feeding it. If you've never heard of Meridian Tapping, click here to read more about what it is and why it works. If you would like a free picture guide and more detailed instructions for how you can use Meridian Tapping, click here to download the guide. 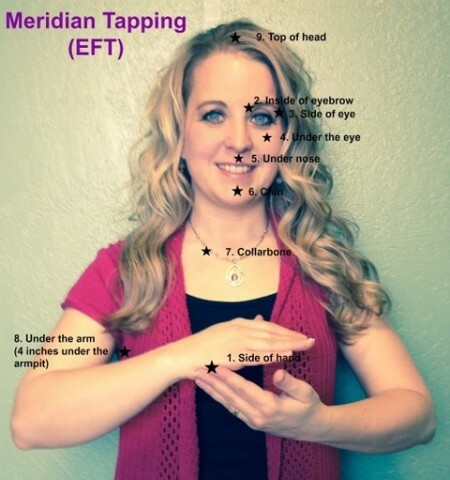 If you want to read more about the latest research concerning Meridian Tapping, click here. Even though I'm feeling all this agitation and combative energy all around me, everywhere I look there seems to be something about it, I love and forgive myself I'm doing the best that I know how. 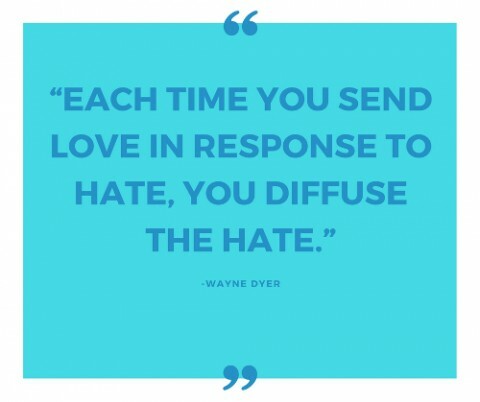 Even though I'm tired of seeing all the stress and negativity on social media and everywhere else, other people's opinions and ideas are really upsetting me, I'm afraid they're going to make these enormous problems worse! I am open to loving and forgiving myself and anyone else who may be involved in the problems we're all facing. Even though I'm feeling so powerless and hopeless right now, I really need to see some great solutions and feel some hope that we're going to get through the upcoming years and thrive and I'm not getting that and it's a miserable feeling, I love and accept myself. I'm doing the best that I know how. Inside of Eyebrow: The stress and opinions of others around this election and the state of our country is really getting to me. Side of Eye: I can't even look at social media without feeling agitated or even combative when I see what some people's political views are. Under the Eye: The debates leave me feeling on edge and uncomfortable. Under the Nose: Right at the moment I'm not sure what the best solutions are but sometimes it doesn't feel like we're headed in the right direction. Chin: I feel this dull underlying anxiety all around me that I just can't shake. Collarbone: It's been there for so long I almost forget it's there. Under the Arm: Yet it's agitating my system. Top of the Head: I think I'm feeling and responding to all the stress and anxiety that people everywhere are feeling right now. Inside of Eyebrow: This is a confusing and challenging time. Side of the Eye: The lies, manipulation, and confusion are maddening. It makes me wonder about our future and especially our children's future a lot! Under the Eye: Even though all of this is challenging and exhausting, I'm choosing to be open to the idea that my angry and stressed out energy is adding to the problem. Under the Nose: Each one of us with our frustration and anger is contributing to the problem by each throwing our own cup of gas on this out of control inferno. Chin: What if, the more upset I get, the more it keeps me plugged in and open to absorbing the anxiety of the collective? Collarbone: What if I could take a deep breath and unplug my energy from this inferno of hopelessness, angry, aggressive energy? Under the Arm: What if I could disconnect and focus on being calm and grounded in the moment? Top of Head: This certainly doesn't mean that I become an ostrich and put my head in the sand and ignore the problems. Perhaps it just means I am working on taking a step back, releasing the yucky energy, and getting more quiet so I can connect with my own inner wisdom and guidance. Inside of Eyebrow: I might not be able to change what's happening around me, but I can work to unplug so I can see through the lies and manipulation. Side of the Eye: The more quiet and calm I can be, the more wisdom I'll be able to find. I need this quiet calm to help me know how best I can navigate my life and thrive in the upcoming years. Under the Eye: Perhaps we all have knowledge and specific gifts designed to help us all find our way through the problems we're facing. Under the Nose: The problem is, most of us have been completely distracted and drained by all the stress and attacking energies in the collective right now. Chin: I'm choosing to consider the idea that each one of us that unplugs and stops feeding the monster, helps to diminish the stress and open the space for new solutions and calm to enter our world. Collarbone: I would far rather be an agent for calm and healing solutions than arguing and raging about what's going on. Under the Arm: What if this is the most empowered way to work to heal things? Top of the head: It feels better than fighting and feeling powerless and hopeless. Inside of Eyebrow: I might not have all the answers in this moment but I can work to unplug and feel calmer. Side of the Eye: I can find a way to navigate the problems we have and feel better at least. Under the Eye: I'm open to seeing the whole situation energetically as a big flaming ball that's being surrounded by calming water and spiritual help. Under the Nose: I'm open to trusting that as I unplug and focus on being strong and grounded others will feel that and unplug as well. Chin: Maybe my own feelings of calm will help others to feel calmer too. Collarbone: I'm open to becoming an excellent navigator in my life. Under the Arm: There may be raging rapids all around me but I can focus on doing an excellent job steering clear of jagged rocks and problems the very best way that I can. Top of the Head: The more I learn to master the way I navigate through the problems around me, the smoother and better my life becomes. Take a moment to think about all the things that are going really well in your life. All the things that you really appreciate about your home and the world you live in. Thank you for taking a moment to participate in this clearing exercise. Considering Einstein's quote, each one of us that works to clear the stressful energy, contributes to calming things down and creating a more peaceful world. **Please share this article with anyone you think might be open or interested in healing and empowerment.